Long-time readers of this blog know that I can be a bit of a roller coaster geek when I want to. Recently I was doing some geeking out on the subject with a friend of mine who grew up on Long Island and told me about an infamous venue that had somehow been off of my radar: Action Park in Vernon, NJ, which operated from 1978 to 1996. Of course, I had no choice to Google it when I got home – and I was interested to learn that Action Park is coming back this summer. Notorious for poorly designed and unmaintained rides, inattentive and sometimes inebriated staff, being its own insurance carrier and at least six confirmed fatalities, Action Park has achieved what might be described a cult status in the years since its closing. According to a documentary, any who grew up in the area considered visiting–and surviving–the park a rite of passage. While changes in the amusement park industry will require the park to be more stringent about safety when it re-opens, the idea just might be crazy enough to work. Though it was badly executed, Action Park’s business model was in fact ahead of its time. In addition to being often credited as being the first modern water park, Action Park’s concept was to allow the guests more involvement with the ride experience. In the late 1970s, the various Six Flags, Disney and Sea World franchises were becoming dominant; it’s perfectly understandable that there would have been a market for a rawer, less polished amusement park experience; perhaps a nod to the “Golden Age” of roller coasters such as the Crystal Beach Cyclone, which supposedly had a nurse stationed outside the exit to tend to fainting riders. Fast forward to 2014. Disneyland has recently received bad press for running out of Frozen merchandise and for raising its ticket prices to $96 for guests ages 10 and up; Action’s new admission prices are less than half that. It’s not just about cost, though. This is the world of “Throwback Thursday” (I’m sorry, #TBT); it’s inevitable that when people find information about a long-lost institution, they’ll geek out over it. Nostalgia never goes out of style and when one gets a chance to actually revisit a place of their childhood–albeit likely a different version of it–it seems likely that they will take advantage of it. There’s also the growing CTFD method of parenting (the C stands for “Calm” and the D for “Down.) I’m not suggesting that parents should disregard their kid’s safety; I’m just speculating that Action Park might be a venue where parents could practice the CTFD method. After all, with fewer restrictions, likely shorter wait times for rides than bigger theme parks, kids may be able to burn off more energy, helping incubate a CTFD environment on the ride home. Will these factors make the new Action Park a success? We’ll see; perhaps–for better or worse–Action Park will put New Jersey on the map this summer for something other than Pauly D.
Roller coasters are not only fun, they’re also educational. They are living lessons of architecture, art and physics. On our eighth grade graduation trip to Riverside Park (now Six Flags New England) in Agawam, MA, our sales pitch to get our science teacher to ride the “Cyclone” was that if he puked, he would be able to tell how fast it was going when it hit the ground. But I digress. Dorney’s small wooden roller coaster was built in 1923, and has always been a favorite of enthusiasts. While bigger, shinier, faster and more expensive coasters have popped up throughout the world, many mavens cherish Dorney’s coaster as a throwback to the golden age of wooden roller coasters. Needless to say, the Great Depression was not kind to amusement parks. Even post-war prosperity didn’t help the majority of America’s small amusement parks, as larger attractions like Disneyland became dominant. But through it all, Dorney’s coaster still delivered thrills to customers. 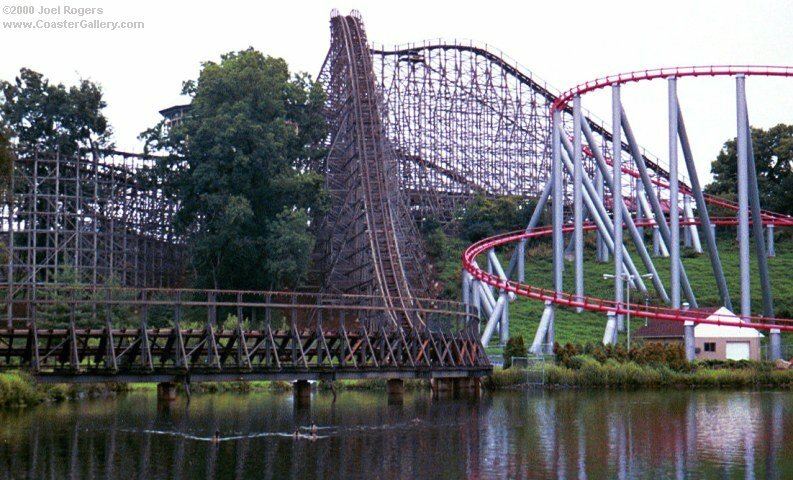 In the early 1970s, a park called Kings Island opened near Cincinnati, replacing the Coney Island park that had been damaged by floods. The Racer, a wooden coaster featured on an episode of “The Brady Bunch”, was an instant hit, and in the late 1970s, construction started on a new ride. When The Beast opened in 1979, it was the tallest, fastest and longest roller coaster in the world. Although the unorthodox coaster has drawn its share of criticisms (mainly toward the second lift hill, leading to a drop at a mere 18 degree angle, only to hit the brakes at the station), the ride has been a huge success. In 1989, Dorney Park opened Hercules. 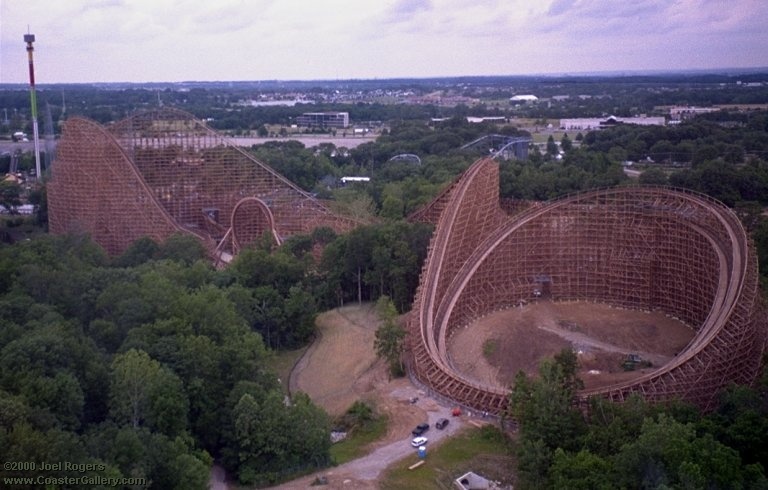 While the ride was not longer or taller than the Beast, its location on a hillside allowed it to break one of the Ohio coaster’s records: height of drop. While the coaster’s hill was only 95 feet tall, the drop set a wooden coaster record at 157 feet, leading into a wide turn over the water. But as it would turn out, the bigger they are, the harder they fall. 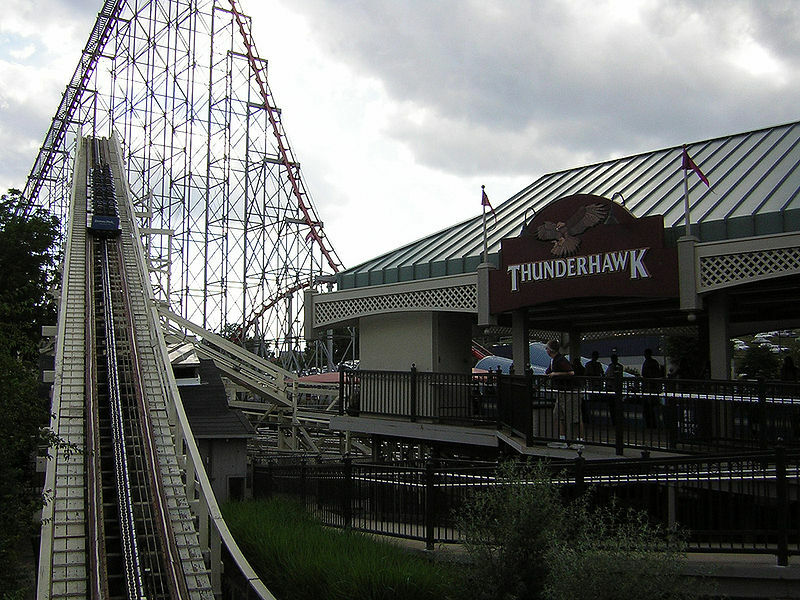 The smaller Coaster, now renamed the Thunderhawk, proved to be a more popular attraction at Dorney than Hercules, which closed in 2003. Son of Beast would last only a decade. In 2006, the vertical loop was removed, but the ride still suffered from maintenance problems. In 2009, a woman claimed to have suffered a head injury on the ride. Although the circumstances of her claim were questionable, and although inspections of the ride found no irregularities, Son of Beast was closed as a precaution, and never re-opened. In hindsight, it’s interesting to consider the fates of these rides. Just as the movie industry has low-budget “sleepers” that beat the odds, and high-budget blockbusters that bomb, the same concept can be applied to amusement parks. Innovations that seem exciting sometimes lose out to time-tested traditions; grand spectacle sometimes falls to simple pleasures. But the Thunderhawk and Beast chug on. While the former lies in the shadow of the enormous Steel Force coaster, it has survived the Great Depression and looks like it will survive the Great Recession to celebrate its 100th birthday in ten years. And for its criticisms, the Beast continues to deliver the goods, proving that its impressive statistics were more than just novelties. For a video of a front-seat ride on the Beast, click here. For a video of Hercules, click here.